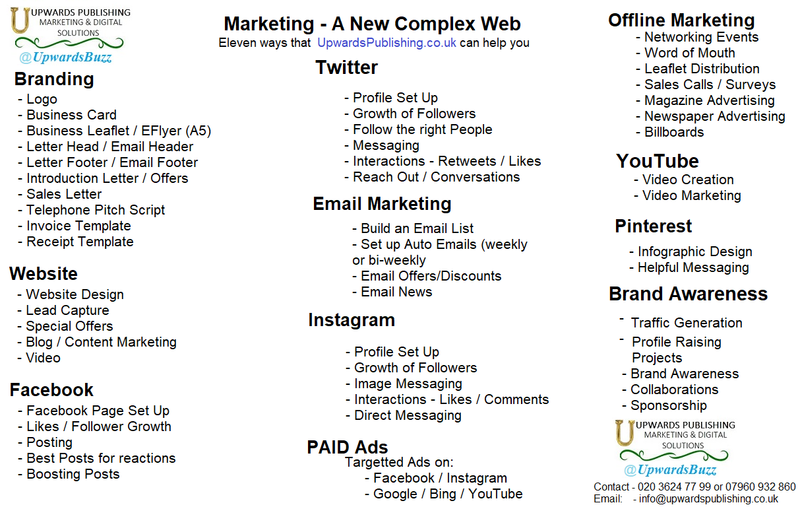 Upwards Publishing, Marketing & Digital Solutions employs several methods to get your message across. Our methods may make you jump for joy. We study your business and ascertain the best way to help. Digital Solutions involve the use of the internet, computers, tablets or mobiles to carry out the marketing of a business or project. The process usually is cheaper, as it takes time and knowledge, but does not require the cost of printing or travelling. Digital marketing is also quick and interactive. People like to respond with comments or reviews. A promotion campaign can be started in 5 minutes. Visitors to your website are called Traffic. How many people visit your website weekly? What was the average daily number of people who visited your website last month? How long do they stay on your website? What is your weekly page views/impressions? Do you know the answers to these questions? If not you need to ask your webmaster. Check your Awstats, Webalizer and Google Analytics if it is installed on your website. We send Real Visitors to Your Website, Facebook Page, Event Page or YouTube Channel. Contact us for costs, or let us know your budget. We promote your profile, so that people find you and CHOOSE to follow you based on your profile. These followers are not bots (software programmes), but real people who are opting to follow you. If Twitter finds that you have used bots, or you hired someone who uses bots, you can get your profile banned – never to be returned. We do things the legal way which fits Twitter’s terms and conditions. Twitter Blast to 200k Hashtag Your Product/Service/Event with images. Twitter Plus Email drive – Two week (14 days) campaign – reach One Million plus – Call to discuss. Facebook Blast to 300k Hashtag Your Product/Service/Event with images. Facebook – Plus Email drive – Two week campaign (14 days) – reach One Million plus – Call to discuss. Effective use of Social Media requires regular messages being sent out, and interactions with followers and those who comment or respond. One message sent a occasionally is ineffective. UPMDs provides targeted promotions to people who are most likely to be your customers. Light promotions to build brand awareness, and promote products, services. Up to 10 messages per day. Heavy duty promotion with 50 plus messages daily. 1 Impression means the page that your ad appears on is in view on a screen. Click through rate can be between 0.01 to 7%. It depends on the banner or text content, and on what you are selling. Appearing on third party websites which target the audience you are looking for can help people to find your product or service. The busier a site is, the more exposure you will get. Start small and work your way up. The larger the banner, the more expensive the placement. Pricing depends on which website your ad will appear on. On a site which gains about 5000 impressions per month your costs could be £20 plus per month. Impressions are page views. Standard Banners sizes in pixels are: 125 x 125, 468 x 60. Large Banners sizes in pixels are: 729 x 90, 250 x 250. 160 x 600. These would be placed on the top of the home page, or at the top right side of the sidebar. Front page top positions are more expensive as they command more visibility. We can be employed to source relevant sites, and manage your banner placement and track effectiveness. There is a weekly management charge, plus the website charge for placing the banner(s) on their site. Much leverage can be gained by employing the use of fun things that people like to do. Designing Competitions, Surveys or Quizzes, gives an opportunity to collect data from interested parties, or to find out what people are thinking about what you plan to offer. Every likes to win a prize, and that is often offered as an incentive to complete a short survey. Even if only one person wins out of 10,000, it is still a magnet. We can set up a Competition, Survey or Quiz for your organisation or business. We will promote the survey, acquire subjects, collate and analyse results. We will make Telephone Calls on your behalf, to promote your product or service. The calls will provide warm leads for you, appointments or sales. Consider 100 calls, from a list on prospects that you provide. An estimated 30 of those calls may need to be repeated to account for people who are busy and want a call later, or telephone message follow ups. Acquire a list. We can provide a list of 100 prospects for you, based on studying your product/service on your website, your competition, and social media. Tabular responses are sent at the end of the day(s). Management of Leaflet Printing and Delivery, plus printing and delivery. Management of Posters/Public Transport /Public place advertising – 15% of Total budget. Management of Radio/TV advertising – 15% of Total budget. Create & Design Sales Letter & Brochure. Send to Print. Source Name and Address of Decision Makers and Buyers by the usse of Prior Email/Telephone Calls to the company. Costs vary, if the client already has the Sales letter and Brochure printed, or we can create these for you. Additional cost would be printing, packaging and postage. Food and Drink Businesses can boost their businesses by offering free tasters of their product. We can set up sampling station in a store, office, exhibition, event or other venue. The client should ship the product and marketing materials to the venue. Products can be sold, there and then. Equipment to be provided by the venue, or hired separately. Client to cover that cost. All services required are invoiced, and payable before the job starts. Jobs, over the value of £200 are permitted to pay 50% up front, and the balance on completion.